This is a Van Heusen Instant Gift Voucher (GV) and would be accepted at listed outlets (for outlet list visit www.gyftr.com/vh). 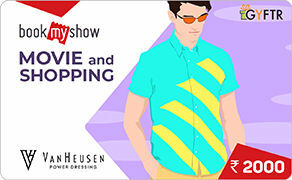 The person who has the Van Heusen GV Code is deemed to be the beneficiary. Do inform the cashier that you plan using the GV for making payments before billing. Customer can only redeem if they are registered as loyalty members. Non-CRM customers need to register before voucher can be redeemed. Only the listed Van Heusen outlets at its sole discretion accept the GV. Van Heusen may add or remove an outlet without giving any prior notice. One GV can be used against one bill. This is a ONE time use GV. No Credit note / Refund for the unused amount of the GV will be given. Van Heusen Insta Gift Voucher CANNOT be revalidated once expired. Van Heusen Insta Gift Voucher can be used during sale. Any dispute related to the Insta Gift Voucher should be referred to the issuing company and the decision of the issuing company shall be final. Van Heusen makes full efforts to accept Instant Gift Voucher, but on account of any technical / administrative reasons an outlet may refuse to accept the same. If an Instant Gift Voucher gets blocked on account of technical issue, please speak to contact centre.